Solar micro-inverters convert direct current (DC) from a single solar panel to alternating current (AC). The electric power from several micro-inverters is combined and sent to the consuming devices. The key feature of a micro-inverter is not its small size or power rating, but its one-to-one control over a single panel and its mounting on the panel or near it which allows it to isolate and tune the output of that panel. Micro-inverters produce grid-matching power directly at the back of the panel. Arrays of panels are connected in parallel to each other and fed to the grid. This has the major advantage that a single failing panel or inverter will not take the entire string offline. Combined with the lower power and heat loads, and improved MTBF (mean time before failure), it is suggested that overall array reliability of a micro-inverter based system will be significantly greater than a string-inverter based one. Additionally, when faults occur, they are identifiable to a single point, as opposed to an entire string. This not only makes fault isolation easier, but unmasks minor problems that might never become visible otherwise … a single under-performing panel may not affect a long string’s output enough to be noticed. 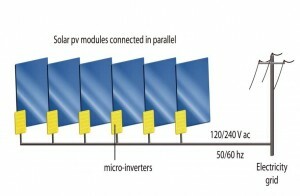 Micro-inverters have become common where array sizes are small and maximizing performance from every panel is a concern. In these cases the differential in price-per-watt is minimized due to the small number of panels, and has little effect on overall system cost. The improvement in energy collection given a fixed size array can offset this difference in cost. For this reason, micro-inverters have been most successful in many markets to include small-medium commercial as well as the residential market, where the limited space for panels constrains the array size, and shading from nearby trees or other homes is often an issue. Another prime reason for the popularity of micro-inverters is the expandability, since additional panels with micro-inverters can be added to the existing system without as much system change as in upgrading a conventional system with solar inverters. A solar array can start with as little as 1 panel & gradually have additional added to it with no maximum size. This is important as a standard string inverter will have to be replaced if the array grows outside of its capabilities. Also, standard inverters have to be replace about once every 5-10 years, while a micro-inverters is expected to last 30-40 years and is warrantied for 25 years.